I am one of a team of facilitators leading a technology-infused professional development series this fall with a fairly large group of educators in school district nearby. We kicked off the series on Thursday night. Like many teaching cadres, this one has a large mix of those who are wary of technology (but are feeling the pressure to use it) and those who are already pretty deep with using technology (and want to go farther). Knowing this, we moved deliberately and slowly, with extension activities for advanced teachers, and lots of hands-on activities. One of the themes of our first session was thinking about the Common Core and our state’s new learning standards, which are built off the Common Core, and digital literacies. 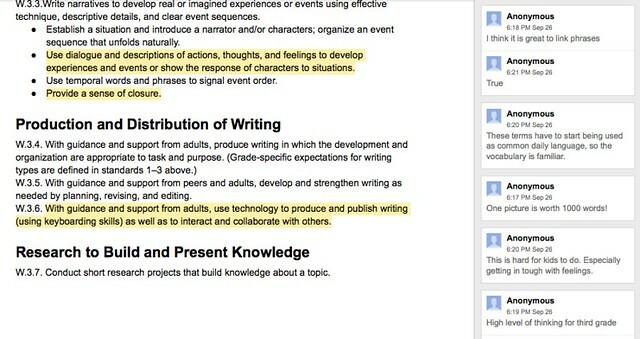 I designed this annotation activity in Google Drive in which we did some “close reading” of the Common Core writing standards as a way to better understand what is being expected of our students. What we hoped that folks would do is not just see the shifts in expectations of young writers in the Common Core, but get a larger sense of the overall development of writing over time. By going deeper into the document itself, we hoped to frame opportunities to talk about how to teach writing. The activity was quite successful, with the teachers sharing their observations along grade bands and then reflecting on how a collaborative annotation activity might unfold in their classrooms. It tied in nicely to an earlier discussion about how to teach “close reading” skills to our students through the coding of text, commenting in the margins, and more. I stole this activity from Bud Hunt (aka, Bud the Teacher) who had used a WordPress Plug-in for his activity a few years back in a P2PU class. Since we will be exploring Google Drive with this group, I figured this collaborative activity using documents would work to set the stage for some of the future sessions in Drive. What I like is how they all dove in and began to realize the power of shared annotation as a way to examine a text together. There was a big “aha” moment when I finally got them to realize the potential of shared documents and crowd-sourcing ideas this way. And of course, it allowed them time to go deeper into the Common Core writing standards with a critical lens. Note: I set this activity up by creating a folder in Google Drive, and then creating an index/title page. Each grade band writing strand was its own page in the folder, and each page was linked off the index page, which was our starting point (linked off our Edmodo space). I then changed the settings on the pages to allow for “comment only” for this activity, and I made sure the setting allowed for “anyone on the web” to access and write comments on the document. While some folks did use their Google accounts, most participants just clicked and started writing as “anonymous” and that was fine. We were designing “low hurdle” activities here to eliminate as much frustration for folks as possible. (And they all got a kick out of Google’s use of obscure animal avatars to represent anonymous writers). This sounds just like what my department needs to do, and I love how you made it manageable. Thanks for sharing. It worked well. I hope it helps. Drop me a line if you need any assistance.